With Fox’s The Gifted currently putting a spotlight on younger mutants, it’s a great time to check in on Marvel’s current Generation X series, which is looking to the future of the X-Men franchise by exploring the lives of current students at The Xavier School For Gifted Youngsters. Writer Christina Strain understands that character dynamics are the most important element of a superhero team book, and she’s committed to exploring the inner lives of her cast, most of whom are caught in the emotional turbulence of adolescence. But she also recognizes the rich history of the X-Men franchise, incorporating past events into her stories in a way that is accessible to new readers while still appealing to longtime fans. 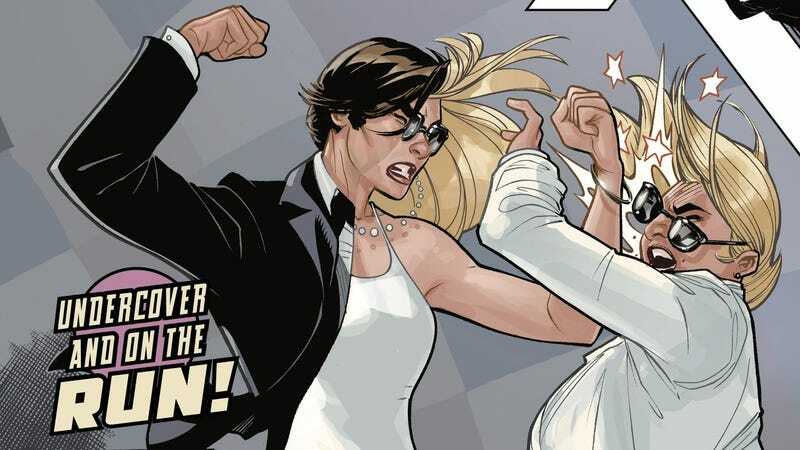 This preview of next week’s Generation X #7 uses that history to comedic effect as Quentin Quire jokes about the twisted relationship between Andrea and Andreas Strucker, a.k.a. the Fenris Twins, who serve as a loose inspiration for the central siblings on Gifted. Quentin keeps the mood light as he gets ready to steal a canister of deadly nano-Sentinels with his teammates Benjamin Deeds and Nathaniel Carver, who are developing a relationship of their own that may or may not be influenced by Benjamin’s mutant power to ingratiate people toward him. Generation X has utilized some excellent fill-in artists as Amilcar Pinna catches up on future issues, with Alberto Jiménez Albuquerque illustrating a delightful Eye-Boy single-issue story and Eric Koda handling the current two-parter. Colorist Felipe Sobreiro keeps the visuals consistent across different artists, and Koda’s work is actually very similar to Pinna’s, with strong, clean inks and intense angles. Koda also draws teenagers that actually look like teenagers, which makes the mutant trio look especially out of place at this supervillain auction. Given this group’s tendency to land into trouble, their plan will probably go south very quickly.